Next month, the Official Twin Peaks UK Festival returns to London to re-create the eerie, fictional town of Twin Peaks, over the weekend of September 29th and 30th at the London Irish Centre in Camden; with activities extending to Camden Square Gardens. Guests will be able to rub shoulders with stars of the show as they dig into some damn fine cherry pie with a cup of coffee. David Lynch Coffee in fact. 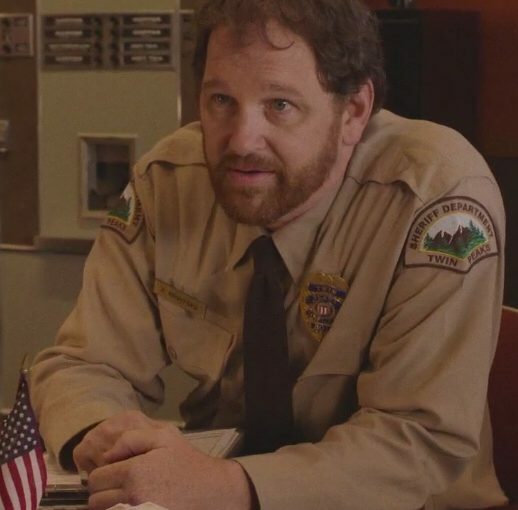 We’ve been lucky enough to get a Q&A with John Pirruccello (deputy Chad Broxford) who’ll be in attendance. QUESTION: What are you most looking forward to, about coming to London and attending the official Twin Peaks UK Festival? JOHN: I’m really looking forward to meeting all of the great fans in person I’ve been interacting with online and the new ones too. A few of them have offered to buy me a pint. So…free beer! I’m looking forward to free beer in London. QUESTION: Free beer is always a great incentive, Will it be your first visit to the UK? JOHN: It is not my first visit to the UK but I have not been for a good long time. It will be a lot like a new city I’m sure with an air of familiarity to it. I really loved London way back then. QUESTION: Can you describe your character, Deputy Chad Broxford? JOHN: Chad is a broken man. He’s arrogant, self-centred and entitled. And not entirely honest! Not nice. QUESTION: What was it like performing in Twin Peaks last year? JOHN: Performing in Twin Peaks was like a dream. A wonderful dream that seems to be recurring! QUESTION: Were you a fan of the original series or was ‘The Return’ your first foray into the world of David Lynch? JOHN: I was very much a fan of the original Twin Peaks. It woke me up like it woke up the rest of us fans. It was a disruption as David (Lynch) might call it. It was impossible to see television the same way after. For more information regarding the festival visit here.